Inktensely dyeing my free yarn – Craft-a-licious . .
Streaking into a craft shop! That’s not a typo in the heading… I’m (cleverly?) using the name of some great dye/colouring blocks from Derwent called ‘Inktense’. Let me tell you the tale .. I happened to be walking through a woollen mill which specializes in alpaca yarn processing the other day. 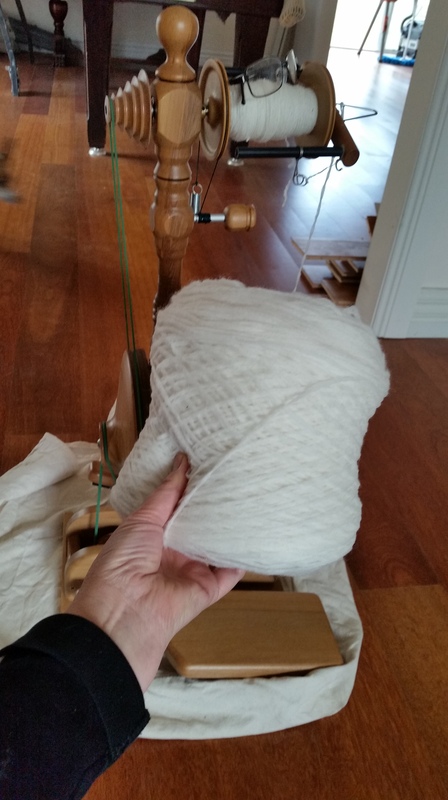 I’m not sure how it all happened, but I ended up with an enormous bobbin of white alpaca pencil roving for free!! I danced back to the car whilst simultaneously congratulating myself on such phenomenal luck as all my Christmases had come at once. I couldn’t believe it! Yay for me!! I never get stuff for free – yay again!! So, once back at the van, i grab my portable spinning wheel from under the bed and start spinning this deliciousness up. A couple of hours later with aching wrists, I decide that’s enough for the moment – and then remember my new Derwent dyes calling for me to try them out. A quarter of the bobbin spun – much, much more to go! 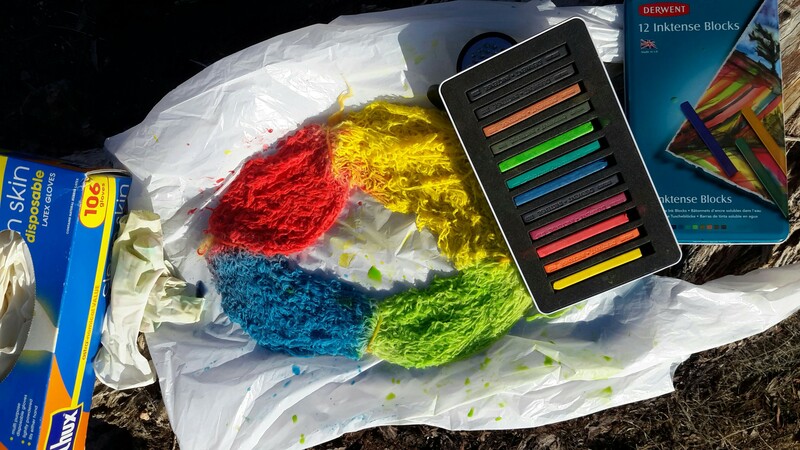 So, after grating some colour from the blocks into the little container you buy with the dyes, add a little water, then dye each quarter of the hank a different colour. Having never dyed yarn before I was basically aiming for any colour that didn’t wash out – I’m not setting my goals too high here! The dyes were, indeed, very strong when applied, but after the yarn dried, and post final rinse, I was very happy with the final muted tones. Not sure if I’ll ply it with other yarns, or knit it as is. We’ve just left – Mildura: I really like this place. Lots of fresh fruit and veggies, bike and walking tracks. Beautiful parks and birds along the river bank and excellent shopping precincts. A growing regional centre, well worthwhile taking the time to visit. We’re now headed towards Streaky Bay via Burra in South Australia. Life’s sweeeet!! Glenda!! You are a lightning speed texter!! Yes, was very happy with the free roving! Thanks for the heads up on Morgan. There really are some lovely spots in SA! Deb! You sweet werken gerl! 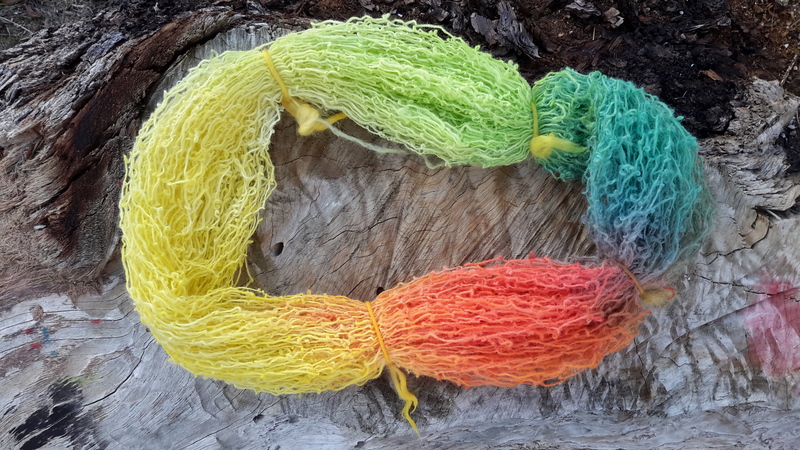 Thanks for commenting – the yarn turned out better than I thought it would so was rather chuffed. I do hope life’s treating you well in Moorabbin and consumers aren’t giving you the pip (wwishful thinking there tho!). Oh yeah baby, that roving was (strangely) free!! I was almost dancing I was so happy. Of course didn’t realize wrist-toll of spinning so much free goodness. Shall be checken out your Pinterest page for help. SA is rather dry, but really love the many old stone buildings in the country towns – such character. Trish you had better take some leave and get yourself down here, it’s beautiful and you’ve only got one life (according to some)! Tomorrow I’m off visiting local craft shop to see what’s on offer. Time for u to get knitten!